March of the Halloween Peeps. | Dinosaur Dracula! 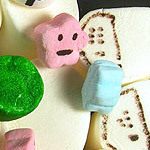 Oof, the guys from Marshmallow Peeps HQ are really dishing it out this year! Whenever I bring up Peeps, I’m assaulted with comments from those who don’t like them. 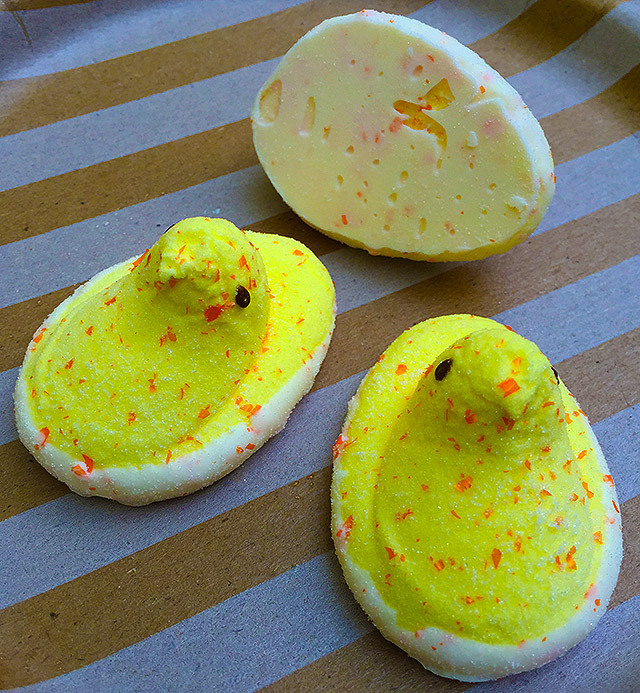 I’ll admit that the last time I truly savored a Peep was probably Easter of 1987, but I still think it’s harsh — to you and to them — to completely discount a candy brand that keeps finding new ways to bring it each and every Halloween season. 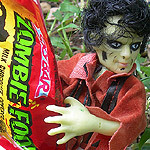 After all, long before Halloween’s current “food boom,” Peeps was letting us eat marshmallows shaped like bats and cats. They lit the torch in far darker times. Let’s repay them with a little loyalty! First and most notable are Pumpkin Spice Peeps, dipped in an attractive white fudge that looks like it should cost so much more than a buck twenty-nine. Maybe the lavish white fudge turned me into too easy a sell, but whatever: They taste downright sophisticated to me. An opportunity to eat a cartoon bird and feel like you’re on a mob wedding’s dessert line is not to be missed. Great stuff! 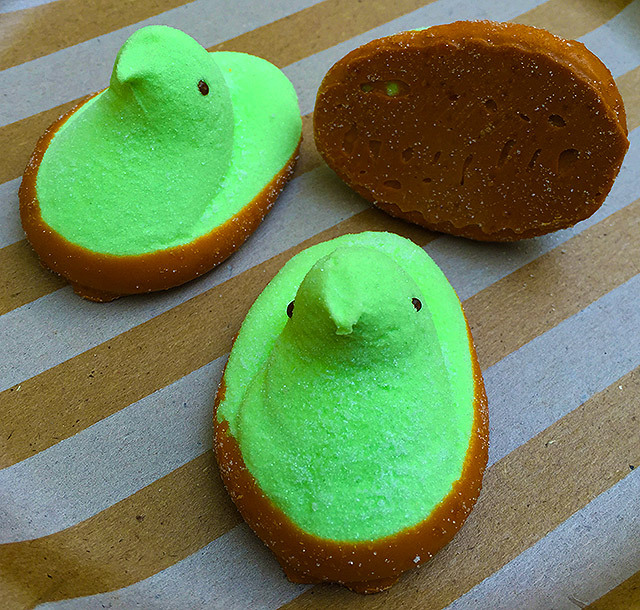 Then we have Caramel Apple Peeps, dipped in caramel fudge. 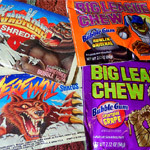 They smell extremely “candylike,” to the point where I’d put the odor closer to Jolly Ranchers than real apples. They’re… okay, I suppose. It’s possible that a bigger fan of caramel apples would find more merit in them, but to me it felt like some pretty disparate flavors were battling for supremacy. Half of it wanted to be sour apple kiddy candy, and the other half wanted to be Valentine’s Day chocolate. Bright side? The packaging is killer. Check out that bag, with its quaint “autumn farm” motif. I usually prefer my Halloween graphics to be creepier, but every once in a while, it’s nice to portray the season as a time for friends to sit on hay bales and ponder the shapes of the clouds. 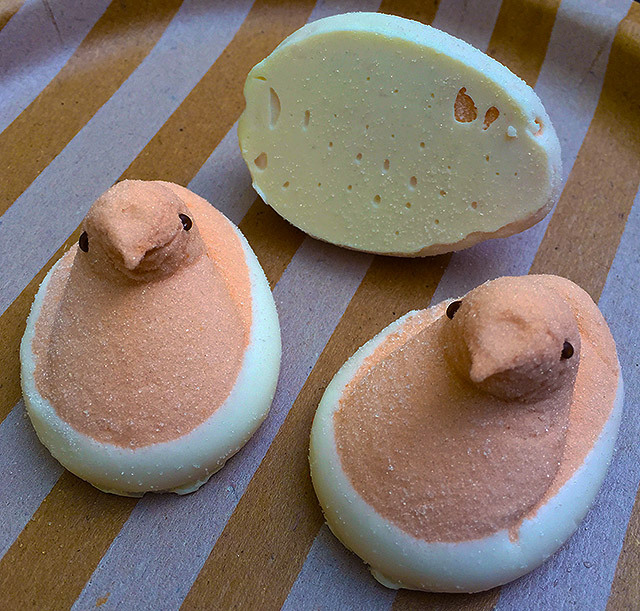 Last but not least, Candy Corn Peeps, dipped in more white fudge. 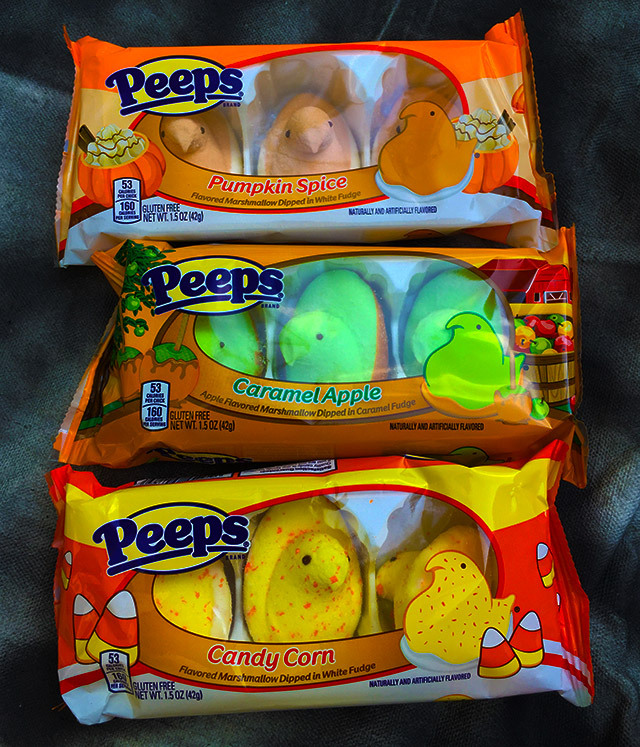 I’m not positive that these are new for 2015, but even if they were around last year, it’s still a crime that Pumpkin Spice Peeps are getting all of the press. Would you look at these? They’re stunning! They look like Peeps that just ate a star in Super Mario. While there’s too much contrary evidence on Dino Drac for me to claim that I actually enjoy candy corn, the smell of these is absolutely on-point. 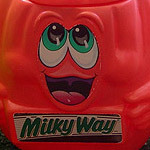 Sometimes, candies that try to mimic candy corn end up smelling like candy corn Febreze. By contrast, the odor of these Peeps is delightfully subtle, being exactly what it should be and not a drop more. 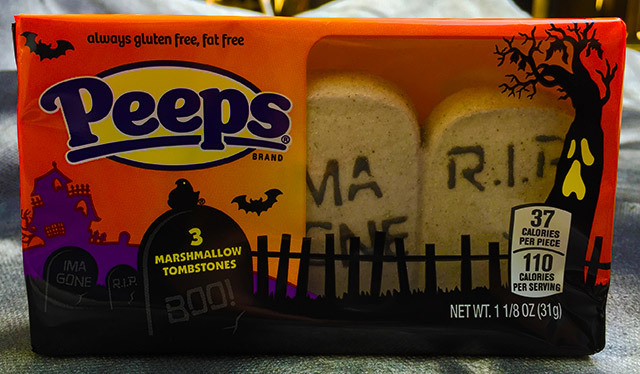 I’m still gonna go with Pumpkin Spice Peeps as the best-tasting, but these are a close second. While having unmistakable traces of candy corn, the fudge changes things enough to where these feel so much more extravagant than little orange teeth that are sold by the barrel for 36 cents. OVERALL: An excellent trio from the Rodda Candy Company, which was presumably named after some Huttese insult I’ve yet to look up on Wookieepedia. 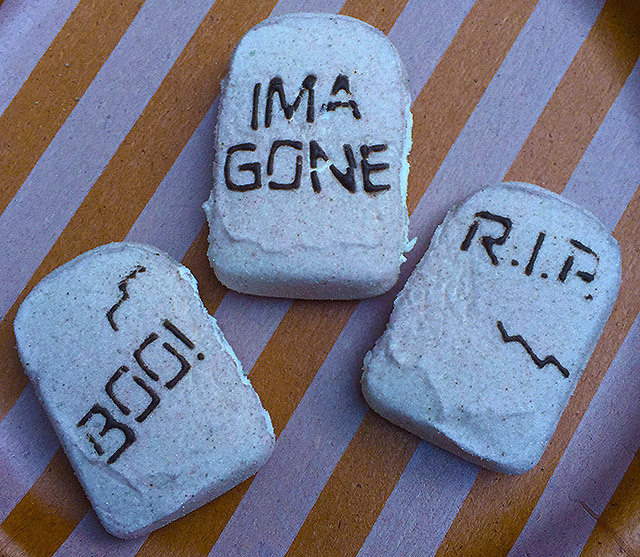 …and since I won’t have another chance to gush about these, I’d also like to point you in the direction of Peeps TOMBSTONES. These aren’t new for 2015, but God, they’re so cool. I love it when cheap candy inspires me to build motherfucking megacakes. 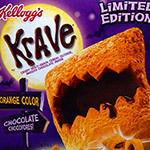 This Halloween season, I expect all of you to give Peeps a chance. All I am sayin’, is give Peeps a chance.